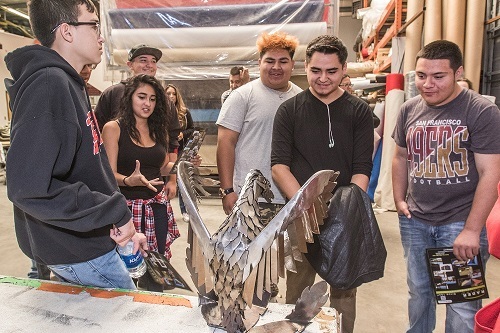 Young people can be hard to impress, but students from Albuquerque’s Academy of Trades and Technology (ATTHS) charter school were visibly stoked by a tour of Rader Awning during 2016 Manufacturing Day events. Before-and-after shots of the 15 ATTHS students who visited the factory where Rader manufactures awnings, shade panels and fabric products illustrate what can happen when young adults get a close look at the world of manufacturing: a transformation from bored detachment to delighted engagement. It’s the kind of transformation that inspires New Mexico Manufacturing Extension Partnership (NM MEP), the organizers and sponsors of local Manufacturing Day, to focus on introducing a fresh generation to careers in advanced manufacturing. U.S. employers have long warned that more than half of the 3.4 million manufacturing jobs expected to open by the mid-2020s could remain empty if companies can’t find workers with the computing, technical, problem-solving and math skills required in the modern “factory.” A 2015 study by the Manufacturing Institute and Deloitte LLC concluded that a domestic talent deficit of this magnitude would mean that customers won’t get the products they need from American companies. 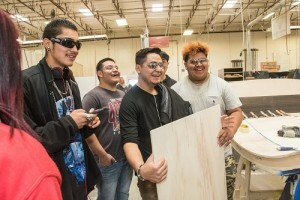 New Mexico MEP uses the monthlong “Mfg Day” celebration to highlight New Mexico-made products and introduce young people to the many career opportunities available in the field. The nonprofit organization’s outreach to high school and college students includes career fairs, manufacturing facility tours and school presentations. 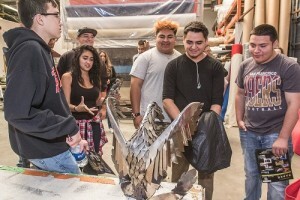 More than 4,600 students participated in New Mexico Mfg Day events last year, and 200 — including the group from ATTHS, some of them described as “at-risk” — attended private tours of 11 facilities where wood flooring, herbal supplements and remedies, organic cosmetics and architectural lighting are produced. Rader Awning was the first stop for ATTHS students on Oct. 18; the second was OGB Architectural Millwork. Students quietly shuffled through the welding, sewing and upholstery work areas at Rader until the end, when company co-owner Jill Mowery-Litt entertained questions. Through ATTHS social worker Dana Flores, one student asked to talk to a company welder he had noticed on the tour. The welder explained how he had made poor choices before heeding life-altering advice to study welding. He perfected his craft through correspondence courses to earn certification. By the time they visited OGB’s facility, where employees design, engineer and create quality woodwork, the students were at full attention. Company president and tour leader Rick Thaler talked about how he acquired woodworking skills as a teenager in the construction trades. Eager to learn, he refined his skills and earned promotion to more demanding positions, eventually buying the business. In a post-tour session, students discussed what types of training they would need to forge their own paths to good-paying employment in manufacturing. According to New Mexico MEP state director Jennifer Sinsabaugh, the shift in attitude, from negative to positive, was palpable. Manufacturing Month 2017 will be celebrated in October. Schools and businesses interested in participating should contact mfgday@newmexicomep.org.